Escape To Dublin City Break Starting Price Euro 89 Gresham Hotels, Dublin. Treat yourself to a relaxing break in the heart of Dublin city. This wonderful package includes 2 nights accommodation in a Standard Double or Twin room with full buffet breakfast in the Gallery Restaurant and One Afternoon Tea for two people in our sumptuous Writers Lounge overlooking OConnell Street. T&C: Booking and staying from now to until 31st December, 2015. Book Now. Weekend Offers: 15% Discount Summer Deal. Weekend Offers: 15% Discount Summer Deal with Breakfast Gresham Belson Hotels, Brussels. Book your Bed & Breakfast rate during the month of August and get 15% discount on your stay at Gresham Belson Hotels, Brussels. T&C: Booking and stay until 31st August 2015. Book Now. Save Up To 20% Advance Purchase Promotion Gresham Belson Hotel, Brussels. Save Up To 20% Advance Purchase Promotion Gresham Belson Hotel, Brussels. Book 21 Days in Advance and save up to 20% at Gresham Belson Hotel, Brussels. Stay for 2 nights and get a 5 % discount on your stay. Stay for 3 nights and get a 10% discount on your stay. Stay for 5 nights and get a 15% discount on your stay. Includes: Free wifi. Free Airport Shuttle Available. One child under 12 years of age stays free of charge in a room occupied by an adult. T&C: Reservation in non refundable and non changeable. Booking and staying from now to until 31st December, 2015. Save 20% Advance Purchase Gresham Belson Hotel Brussels! Save 20% Advance Purchase Gresham Belson Hotel Brussels. Book 21 Days in Advance and Save 20%. Reservation in non refundable and non changeable. One child under 12 years of age stays free of charge in a room occupied by an adult. Book Now. 15% Discount Summer Deal Breakfast Included..
15% Discount Summer Deal Breakfast Included.. Book your Bed & Breakfast rate during the month of July and August and get 15% discount on your stay. Stay 2 Nights & Save 5% OFF!! Stay 2 Nights & Save 5% OFF!! Stay for 2 nights and get a 5% discount on your stay. Room Only. Free WiFi and Airport Shuttle Available. This reservation is non refundable and non changeable. One child under 12 years of age stays free of charge in a room occupied by an adult. Book Now. 2 Night B&B And 1 Evening Meal!! 2 Night B&B And 1 Evening Meal!! From �89 per person. Get away from it all and come relax with us. This package includes 2 nights bed and breakfast with dinner in our new stylish Met Brasserie on the evening of your choice. All guests staying at the hotel have complimentary access to the Leisure Center. Car parking is available in an adjacent car park for 7.50 Euros for 24 hours. All special offers are subject to availability. Book Now. Hamburg Crazy Deal. Best prices, Bed & Breakfast. Free Wifi & welcome drink on Arrival. Breakfast is included. No cancellation possible. This rate includes FREE parking outside the hotel, Free Sauna and Solarium plus coffee and tea facilities in the rooms. Book Now. Escape to Dublin!! Treat yourself to a relaxing break in the heart of Dublin city. This wonderful package includes 2 nights accommodation in a Standard Double or Twin room with full buffet breakfast in the Gallery Restaurant and One Afternoon Tea for two people in our sumptuous Writers Lounge overlooking OConnell Street. A fabulous treat for anyone lovers, mothers, friends and family. Book Now. Gresham Metropole Hotel Easter Week!! Gresham Metropole Hotel Easter Week!! 95� per person - 2 nights B&B, dinner on evening of choice - free Easter Egg in the fabulous Gresham Metro polo Hotel in Ireland. T&C: Booking period: Valid from 02 March - 13 March 2015. Period of stay: Valid from 3 April to 09 April 2015. Use promo code: Easter. Stay & Save Gresham Metropole Hotel! Stay & Save Gresham Metropole Hotel! The Gresham Metropole Hotel is one of the best known hotels in Cork and is renowned for the finest hospitality. Stay 2 Nights & Save 10% - The Gresham Dublin Hotel. 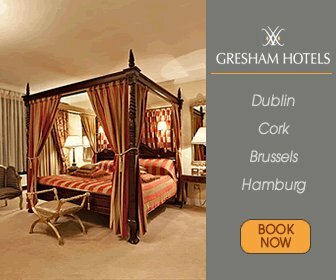 Stay 2 Nights & Save 10% - The Gresham Dublin Hotel. The Gresham Hotel Dublin, part of Gresham Hotels Group, is located in the heart of Dublin city centre and is one of the best known hotels in Dublin. Great Offers Room Only The Gresham Dublin Hotel. The Gresham Hotel Dublin, part of Gresham Hotels Group, is located in the heart of Dublin city centre and is one of the best known hotels in Dublin. Bed & Breakfast Gresham Metropole Hotel!! Bed & Breakfast Gresham Metropole Hotel!! The Gresham Metropole Hotel is one of the best known hotels in Cork and is renowned for the finest hospitality. Hamburg Crazy Deals Gresham Hotels. Hamburg Crazy Deals Gresham Hotels. Best prices, no cancellation possible, Room Only. Free Wifi & welcome drink on Arrival. Breakfast is included. This rate includes FREE parking outside the hotel, Free Sauna and Solarium plus coffee and tea facilities in the rooms. Book Now. Book 5 Nights & Save 20% OFF Gresham Belson Hotel!! Book 5 Nights & Save 20% OFF Gresham Belson Hotel!! Reservation in non refundable and non changeable. One child under 12 years of age stays free of charge in a room occupied by an adult. Book Now. Stay 2 Nights & Save 10% OFF The Gresham Belson Hotel. Stay 2 Nights & Save 10% OFF The Gresham Belson Hotel. Stay for 2 nights and get a 10% discount on your stay. Room Only. Free WiFi and Airport Shuttle Available. Great Value Bed & Breakfast Offers!! Great Value Bed & Breakfast Offers The Gresham Dublin Hotel. The Gresham Hotel Dublin, part of Gresham Hotels Group, is located in the heart of Dublin city centre and is one of the best known hotels in Dublin. Accommodation with Full Buffet Breakfast. Free Wi-Fi on all devices. Close to all shopping and business districts. LUAS (tram) line close-by and easy access to and from Dublin Airport. Close to Croke Park, Three Arena and Convention Centre. Advance Purchase Deal Gresham Belson Hotel in Brussels. Advance Purchase Deal Gresham Belson Hotel in Brussels. Enjoy your stay at the 4 star Gresham Belson Hotel. Breakfast is excluded but can be purchased for �15 per person. Book Now. Christmas Breaks Cork City Centre Hotel!! Christmas Breaks Cork City Centre Hotel!! Christmas 2 night Special. Why not escape this Christmas, and let someone else do all the cooking & washing up. Stay for Two nights bed & breakfasts and including two evening meals. All guests staying at the Gresham Metropole Hotel, can enjoy complimentary access to the Leisure Centre. Book Now. Stay and Save. The Gresham Metropole Hotel!! Stay and Save. The Gresham Metropole Hotel!! The Gresham Metropole Hotel is one of the best known hotels in Cork and is renowned for the finest hospitality. Pay in advance and save. FULL Payment taken from credit card given on day of booking. Non Refundable Non Transferable. Book Now. Guinness Cork Jazz Festival Room Only The Gresham Metropole Hotel! Guinness Cork Jazz Festival Room Only The Gresham Metropole Hotel. Enjoy everything the Cork Jazz Festival has to offer when you book the The Gresham Metropole Hotel. Located at the heart of the Jazz Festival you will have unlimited access to all the stages to the exclusive Festival Club here in the hotel. The Met is the spiritual home of the Jazz Festival so when you stay with us you can enjoy all the great live music until the wee small hours and the great craic of the festival. Stay 2 Nights Save10% Gresham Belson Hotel in Brussels. Stay for 2 nights and get a 10 % discount on your stay. Room Only. Free WiFi and Airport Shuttle Available. The Gresham Belson Hotel, is centrally located between Brussels Zaventem Airport and Brussels City Centre. Stay in one of the best hotels in Brussels and avail of all the great facilities on offer. Stay 3 Nights Save 15% The Gresham Hotel Dublin City Centre!! Stay 3 Nights Save 15% The Gresham Hotel Dublin City Centre!! The Gresham Hotel Dublin, part of Gresham Hotels Group, is located in the heart of Dublin city centre and is one of the best known hotels in Dublin. Stay 3 nights and save 15%. Stay 3 nights and save 15%. Book Now. Crazy Deal Gresham Carat Hotel Hamburg!! Crazy Deal Gresham Carat Hotel Hamburg. Best prices, Bed & Breakfast. Free Wifi & welcome drink on Arrival. Breakfast is included. No cancellation possible. This rate includes FREE parking outside the hotel, Free Sauna and Solarium plus coffee and tea facilities in the rooms. Book Now. Advance Purchase Deal Gresham Belson Hotel in Brussels!! Advance Purchase Deal Gresham Belson Hotel in Brussels. Enjoy your stay at the 4 star Gresham Belson Hotel. Breakfast is excluded but can be purchased for €15 per person. Book Now. Christmas Breaks The Gresham Metropole Hotel! Christmas Breaks The Gresham Metropole Hotel! Why not escape this Christmas, and let someone else do all the cooking & washing up. All guests staying at the Gresham Metropole Hotel, can enjoy complimentary access to the Leisure Centre. Car Parking is 7.50 Euros per 24 hours in our secure Car Park. Book Now. Romance for Two with Gresham Hotel. Romance for Two with Gresham Hotel. Treat your loved one to a special night away at The Gresham Metropole Hotel. This package includes the following: 1 nights accommodation in one of our Executive rooms, with full breakfast the following morning. Also included is a perfectly chilled bottle of sparkling wine on arrival, a single red rose and handmade chocolates. Book Now. Stay & Save 10% The Gresham Metropole Hotel! Stay & Save 10% The Gresham Metropole Hotel. Stay longer for less and save... Stay 2 nights and save 10% or 3 nights and save 15%. or pay in advance and save. Book Now. 3 Nights Room Only Save 15% Gresham Hotels!! 3 Nights Room Only Save 15% Gresham Hotels!! 3 Nights Room Only Save 15%. Room Only. FREE cancellationTaxes IncludedFree Wi Fi. 15% Off Best Available Rates Accommodation. Book Now. Stay 2 Nights Save 5% The Gresham Belson Hotel. Stay for 2 nights and get a 5 % discount on your stay The Gresham Belson Hotel. Room Only. Free WiFi and Airport Shuttle Available. Book Now. 15% Discount & Free Upgrade for Gresham Belson Hotel!! Take 15% Discount & Free Upgrade for Gresham Belson Hotel! Book before 19th September and get a 15 % discount, as well as a free upgrade to a spacious executive room upon availability. Breakfast and free Airport shuttle are included. T&C: Upgrade upon availability. Booking period:st August - 19th September. Period of stay: 1st August - 31st October. Valid only for Gresham Belson Hotel. 33% Discount on 3 Night Stay Gresham Belson Hotel!! 33% Discount on 3 Night Stay Gresham Belson Hotel!! Stay for three nights and only pay for 2, we are giving you a 33% discount on every three night stay. Valid for Gresham Belson Hotel. Book Now. 15% Reduction & Upgrade for Your Summer Bookings! We offer a 15% reduction on the best available rate throughout summer AND if possible we will give you a free upgrade to a higher room category. T&C: Free cancellation until 24 h in advance. Valid only for Gresham Belson Hotel. Booking period: Until 07/09/2014. Period of stay: From 19/06/2014 to 07/09/2014. Escape to Dublin with Taste of Gresham Hotels!! Escape to Dublin with Taste of Gresham Hotels!! Treat yourself to the luxury you deserve in the traditional style and grandeur of The Gresham Hotel in the beating heart of Dublin City. This wonderful package includes 2 nights accommodation in a Standard Double or Twin room with full buffet breakfast in the Gallery Restaurant and One Afternoon Tea for Two People in our sumptuous Writers Lounge overlooking O Connell Street A fabulous treat for anyone lovers, mothers, friends and family. Breaks in Brussels Gresham Hotels!! Breaks in Brussels Gresham Hotels!! Stay 2 Nights Save 10%.. Stay for 2 nights and get a 10% discount on your stay. Room Only. Free WiFi and Airport Shuttle Available. Cork Value Breaks Gresham Hotels!! Cork Value Breaks Gresham Hotels!! 2 Night B&B and 1 evening meal.. From €89 per person. Get away from it all and come relax with us. This package includes 2 nights bed and breakfast with dinner in our new stylish Met Brasserie on the evening of your choice. All guests staying at the hotel have complimentary access to the Leisure Center. Car parking is available in an adjacent car park for 7.50 Euros for 24 hours. All special offers are subject to availability. Hamburg Crazy Deals Gresham Hotels! Hamburg Crazy Deals Gresham Hotels! Best prices, no cancellation possible, Room Only. Free Wifi & welcome drink on Arrival. Breakfast is included. This rate includes FREE parking outside the hotel, Free Sauna and Solarium plus coffee and tea facilities in the rooms. Stay at Gresham Dublin Offer. Stay at Gresham Dublin Offer. Check in to The Gresham from 10am in the morning, relax into your standard double or twin room. Armed and ready with your €50 voucher for Arnott s one per package Department Store, head out into the city and shop to your heart s content. Back at The Gresham, enjoy a cocktail in Writers Bar. The following morning, breakfast is available in The Gallery Restaurant and take advantage of the late checkout until 4pm. Get 33% Discount on 3 Night Stay Gresham Belson Hotel. Get 33% Discount on 3 Night Stay Gresham Belson Hotel. Stay for three nights and only pay for 2, we are giving you a 33% discount on every three night stay. Valid for Gresham Belson Hotel. Gresham Hotels Best Available Rate! Gresham Hotels Best Available Rate with Complimentray Breakfast Inclusive. Looking for the best rates for your break away? Book in advance and benefit from our Advance purchase offer. Complimentary breakfast inclusive. Valid for The Fleet Street Hotel. T&C: 24 hour cancellation prior to midday day of arrival. Stays from Sunday to Thursday. Blackout dates apply. Booking window: Valid until 31.12.2014. Stay window: Valid until 31.12.2014. Gresham Belson Hotel Offers You: Get 20% OFF!! Gresham Belson Hotel Offers You: Get 20% OFF!! The Gresham Belson Hotel, gladly offer you a 20 % reduction. You can benefit from our free shuttle service to and from the Airport as well as free wireless internet connection and the 100 international channels on the HD Television systems. The Hotel is located in a quiet rural area with lots of shops and restaurants around with easy acces to the city center by public transportation. T&C: Booking window: From 2013/11/22 to 2014/01/16. Stay window: From 2013/12/01 to 2014/01/16. Special Winter Pomotion Gresham Hotels! Special Winter Pomotion Gresham Hotels! Take a well deserved weekend break this winter and relax with us at The Gresham Metropole Hotel. This offer includes 2 nights bed and breakfast and a 2 evening meals in our Riverview Restaurant. Car Parking is 7.50 Euros per 24 hours in our secure Car Park. Min Stay : 2. From : €99. Nights Dinner Bed and Breakfast Gresham Hotels. Nights Dinner Bed and Breakfast Gresham Hotels. Come to Cork and enjoy one nights Bed & Breakfast and a four course dinner in our Riverview Restaurant. Ideally located in the centre of Cork close to all the local attractions as well as the superb shopping experience that Cork has to offer. Relax in the evening in the luxurious foyer or our stylish Met Bar. All guests staying at the Gresham Metropole Hotel, can enjoy complimentary access to the Leisure Centre. Min Stay : 1. From : €49.50 per person. Christmas 2 Night Break Gresham Hotels! Christmas 2 Night Break Gresham Hotels! Why not escape this Christmas, and let someone else do all the cooking & washing up. Stay for Two nights bed & breakfasts and including one evening meal in the Riverview Restaurant. All guests staying at the Gresham Metropole Hotel, can enjoy complimentary access to the Leisure Centre. Car Parking is 7.50 Euros per 24 hours in our secure Car Park. Min Stay : 2. From : €159 per person. International Garden Show Special. Description : This package includes a Superior Room with breakfast, an Irish welcome drink and a Map for the IGS Area. We have the possibinility to organize a bike rental from 15.00 € per day please let us know 48h prior to arrival and we will upgrade you in the higher categorie if avilable. Stay and Save at Gresham Hotel. Stay and Save at Gresham Hotel. Stay longer for less and save... Stay 2 nights and save 10% or 3 nights and save 15%. or pay in advance and save. Description : Advance Purchase special offer: Full Payment taken from credit card given on day of booking. Non Refundable Non Transferable. Min Stay : 1. From : €59. Romance Packages. Romantic package at The Gresham hotel in Dublin City. This wonderful package Includes: 2 nights accommodation in a Standard double. Buffet breakfast in the Gallery Restaurant. 1 Bottle of Chilled Champagne. Midweek Breaks Gresham Offer. Enjoy a Mid Week stay at the 4* Gresham Hotel. Value Addition: Breakfast. Wi fi. Weekend spa and many more. Best Available Rate Gresham Offer. Best Available Rate Gresham Offer. Description : Best Available Room Only Rate. Free Wi Fi. The Gresham Hotel is easily reached from Dublin Airport take any Aircoach to the O'Connell St Gresham Hotel stop, or the 747 bus to O'Connell Street. City Breaks Gresham Offer. Why not try one of great city offers. Check in to The Gresham from 10am in the morning, relax into your standard double or twin room. Armed and ready with your €50 voucher for Arnott's (one per package) Department Store, head out into the city and shop to your heart's content. Back at The Gresham, enjoy a cocktail in Writers Bar. The following morning, breakfast is available in The Gallery Restaurant and take advantage of the late checkout until 4pm. Min Stay : 2. From : €280. Belgian Beer Weekend Special. Description : Special Discount for the Belgian beer weekend. Min Stay : 1. From : € 59. Romance For Two with Gresham Hotel. Treat your loved one to a special night away at The Gresham Metropole Hotel. This package includes the following: 1 nights accommodation in one of our Executive rooms, with full breakfast the following morning. Also included is a perfectly chilled bottle of sparkling wine on arrival, a single rose and handmade chocolates. Min Stay : 1. From : €60 per person. Advanced Autumn Booking Offer. Description : We offer a 30 % discount to all ready to book well in advanced, including breakfast and shuttle service to and from the airport. Min Stay : 1. From : 30% discount. Romance Packages!! Description : Treat yourself to the break you deserve in the traditional style grandeur of The Gresham Hotel in the beating heart of Dublin City! This wonderful package includes 2 nights accommodation in a Standard double or twin room with full buffet breakfast in the Gallery Restaurant and 1 Bottle of Chilled Champagne in your room upon arrival, alternatively, this can be served for you in the Writers lounge. Min Stay : 2. From : €280. International Garden Show Special. Description : This package includes a Superior Room with breakfast, an Irish welcome drink and a Map for the IGS-Area. We have the possibinility to organize a bike rental from 15.00 € per day (please let us know 48h prior to arrival) and we will upgrade you in the higher categorie (if avilable). Min Stay : 1. From : €99.00. Stay and Save at Gresham Hotel. Stay longer for less and save!!! Stay 2 nights and save 10% or 3 nights and save 15%. or pay in advance and save. Advance Purchase special offer: Full Payment taken from credit card given on day of booking. Non Refundable Non Transferable. City Breaks Gresham Offer. Description : Check in to The Gresham from 10am in the morning, relax into your standard double or twin room. Armed and ready with your €50 voucher for Arnott's (one per package) Department Store, head out into the city and shop to your heart's content. Back at The Gresham, enjoy a cocktail in Writers Bar. The following morning, breakfast is available in The Gallery Restaurant and take advantage of the late checkout until 4pm. Min Stay : 2. From : €280. Best Available Rate Gresham Offer. Description : Best Available - Room Only Rate. Free Wi-Fi. The Gresham Hotel is easily reached from Dublin Airport - take any Aircoach to the O'Connell St (Gresham Hotel) stop, or the 747 bus to O'Connell Street. Min Stay : 1. From : €99. Midweek Breaks Gresham Offer. Enjoy a Mid-Week stay at the 4* Gresham Hotel. Value Addition: Breakfast. Wi-Fi. Weekend spa and many more. Romance for Two at Gresham Hotel!! Romance for Two at Gresham Hotel!! Description : Treat your loved one to a special night away at The Gresham Metropole Hotel. This package includes the following: 1 nights accommodation in one of our Executive rooms, with full breakfast the following morning. Also included is a perfectly chilled bottle of sparkling wine on arrival, a single rose and handmade chocolates. Min Stay : 1. From : €60 per person. Belgian Beer Weekend Special!! Description : Special disount for the Belgian beer weekend. Min Stay : 1. From : € 59. Last Minute Summer Rate. Description: Book a room during the belgian summer holidays at 99€ including breakfast and get a FREE upgrade to an executive room.. Min Stay : 1. From : € Including Breakfast. The Gresham Hotel is one of the leading 4 star Hotels.